When it comes to computer building, yes, looks do matter. It sort of annoys me when people say a PC's appearance is meaningless. The same could be said about cars, clothes and houses -- why bother having different colors? They should all be gray! True, they would essentially function the same, but it would be rather boring too, right? So no, there is nothing wrong with taking pride and having fun with your computer's appearance -- both inside and out. 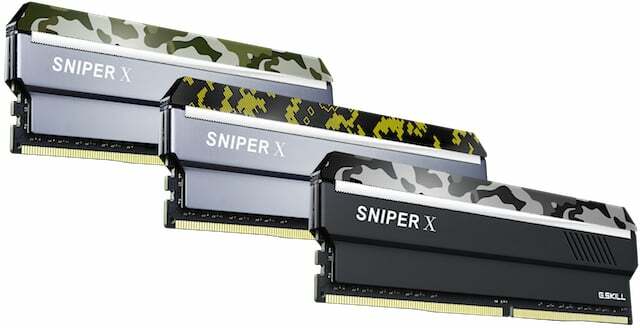 To drive that point home, G.SKILL launches new DDR4 RAM sticks under the "Sniper X" branding. This memory stands out because of its appearance. You see, the company has given it really cool camouflage-inspired heatsinks. Appearance aside, kits can be had in capacities up to 128GB with speeds up to 3600MHz -- it is not form over function! 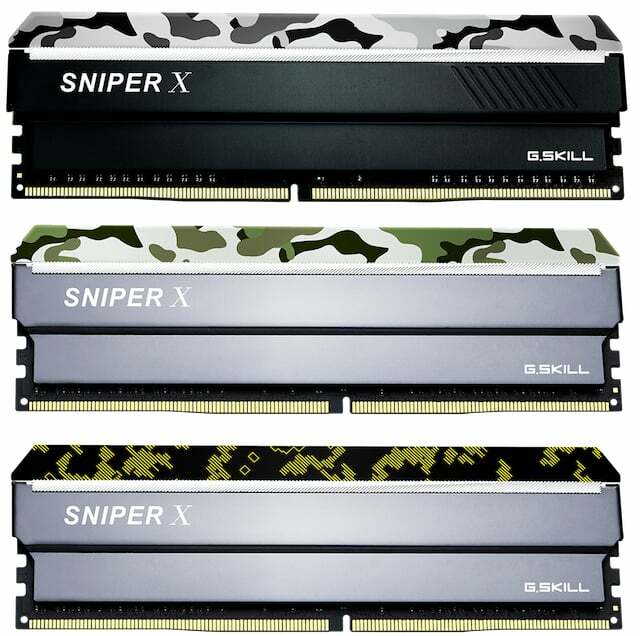 "Sniper X is designed with a militaristic camouflage top bar to compliment any gaming system with offerings in three distinct patterns: Classic Camo, Urban Camo, and Digital Camo. Classic Camo is inspired by the classic jungle green camouflage design, while Urban Camo is styled to blend into a concrete jungle combat setting with multiple shades of gray. And developed to match the ASUS TUF Gaming series motherboard, the Digital Camo features yellow stylistic highlights for a modern warfare look. All three variations are paired with minimalistic aluminum heatspreaders that further optimizes cooling performance under heavy computing load, so you won’t miss out on the next firefight," says G.SKILL. The memory-maker also shares, "Never miss a shot with memory speeds ranging from a standard DDR4-2400MHz up to an extremely fast DDR4-3600MHz. On top of the blazing speed, kit capacities are also offered up to an impressive 128GB (8x16GB) configuration for PC systems that handle gaming and content creation, such as 3D rendering or multimedia editing. Each memory kit is also validated under a series of rigorous tests for maximum compatibility and reliability on a multitude of platforms." Pricing is unknown at this time, but G.SKILL promises they will be available at some point in Q4 2018, which, with this being January, we are already in. With that said, they should pop up at retailers like Amazon and Newegg fairly soon. All three styles are very attractive, but I am partial to the "Urban Camo" variant. Why? My current gaming PC has a white and black color motif, and they would look rather nice in there -- yes, I have a window on my case. With that said, both Digital and Classic look cool too, so you really cannot go wrong either way. Please tell me which of the three styles is your favorite in the comments below.